Embark on a gorilla tracking and Golden Monkey tour in Rwanda’s Volcanoes National Park and get back home with amazing unbelievable stories to tell. Pick up at the border or at your hotel/ Airport then drive to volcano hiking point in Kibati Mount Nyiragongo is an active stratovolcano with an elevation of 3470 m (11382 ft) in the Virunga Mountains associated with the Albertine Rift. It is located inside Virunga National Park, in the Democratic Republic of the Congo, about 20 km (12 mi) north of the town of Goma and Lake Kivu and just west of the border with Rwanda. The main crater is about two kilometres wide and usually contains a lava lake. The crater presently has two distinct cooled lava benches within the crater walls – one at about 3,175 metres (10,417 ft) and a lower one at about 2,975 m (9,760 ft). Nyiragongo’s lava lake has at times been the most voluminous known lava lake in recent history. The depth of the lava lake varies considerably. A maximum elevation of the lava lake was recorded at about 3,250 m (10,660 ft) prior to the January 1977 eruption – a lake depth of about 600 m (2,000 ft). A recent very low elevation of the lava lake was recorded at about 2,700 m (8,900 ft). 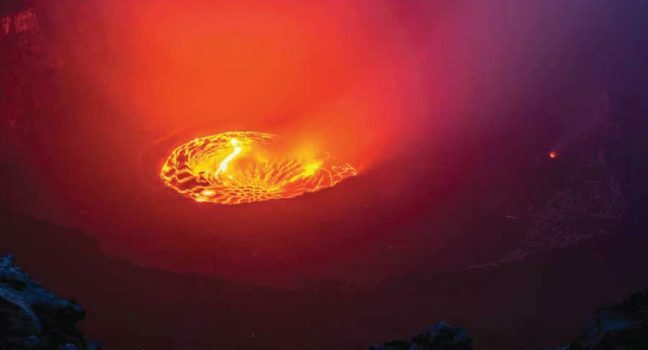 Nyiragongo and nearby Nyamuragira are together responsible for 40% of Africa’s historical volcanic eruptions. You have two full days of gorilla tracking. Have an early breakfast and be transferred to Kinigi Park Headquarter for briefing before you start the trekking activity in the park. Trekking through the forest, hills and swamps can be tough, strenuous and tiring, sometimes taking up to 8 hours in the forest. But coming in contact with the great primates is well worth the effort. You spend one hour with the gorillas which is a truly amazing experience.